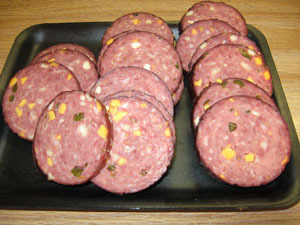 We make great sausage from your deer, elk, bear, antelope, yak, lama, moose, mountain lion, lamb, hog, goat, beef, or poultry. 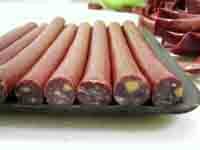 Or you can buy from our retail selections. 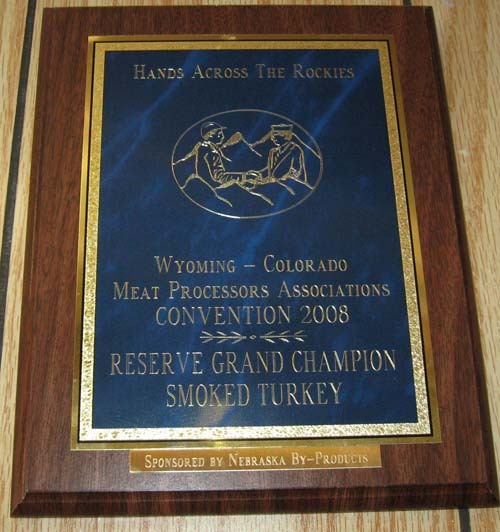 Stop in and check out our retail selection. 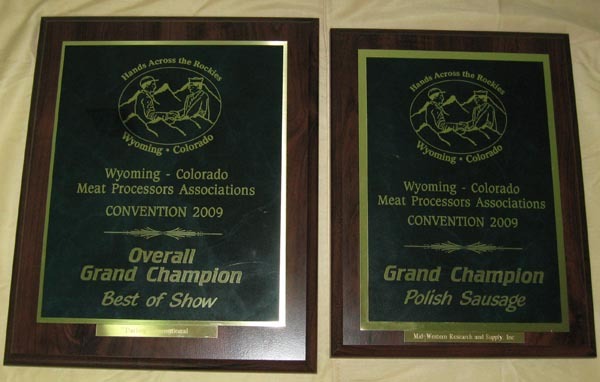 View some of the awards that have been won at the Colorado - Wyoming Hands Across the Rockies Convention. 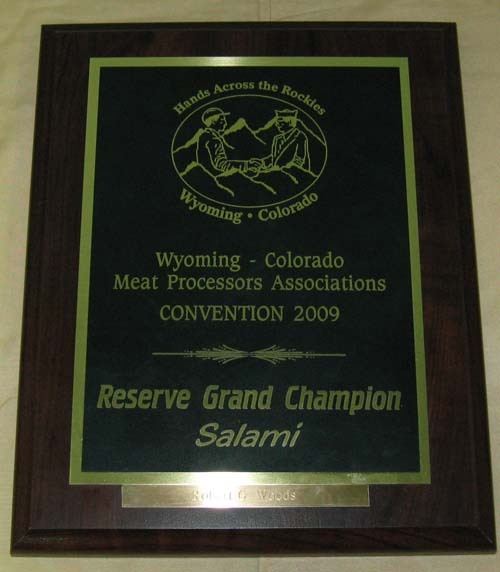 The conventions are held alternate years between Colorado State University and the University of Wyoming. For more information about the conventions, click on the CAMP link on the left. 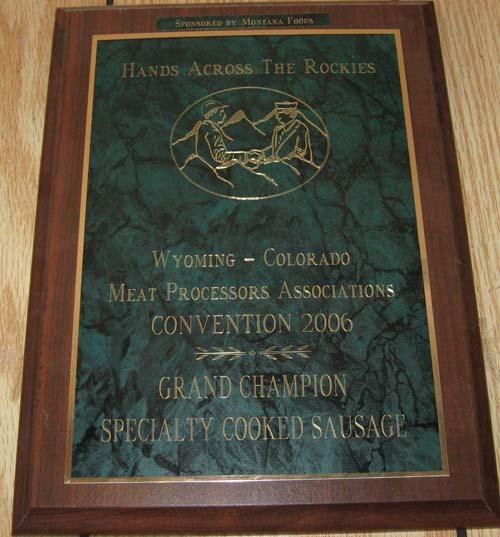 Competition is against the meat processors of both states and we have taken home over all Grand Champion twice and 1 point from making it three times. 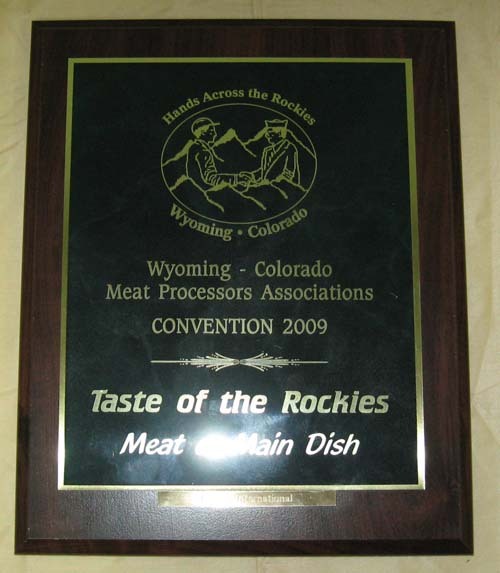 We have many 1st place, 2nd and 3rd places plaques. 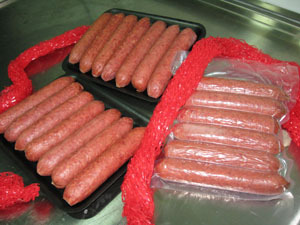 You can click on the sausage page to see and order these specialty sausage. There are several to choose from. They were given to the adult men in the family at Christmas. 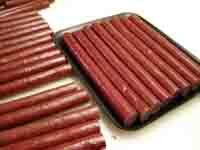 They all poised for a picture wearing their special gifts in front of the meat plant. When Orville turned the plant over (2008) to his daughter – Theresa (Terri) and her husband Terry, they decided to add the tag phrase “a kinder gentler slaughterhouse” to all their advertising. Some people just didn’t get it. Theresa’s youngest son was helping a customer one day and they asked what “A kinder gentler slaughthouse” meant? So after work he asked his mother Theresa what he should tell people when they asked that question? She reflected back to a time when the person that kills the animals for them was asked if he had every done a “Kosher kill”. The kill guy shrugged his shoulders and said, “I pet em’ then shoot ‘em.” (Just for the record, he was being funny. He knows what Kosher kill is and there's no shooting involved) Theresa thought this was funny and remembered it. 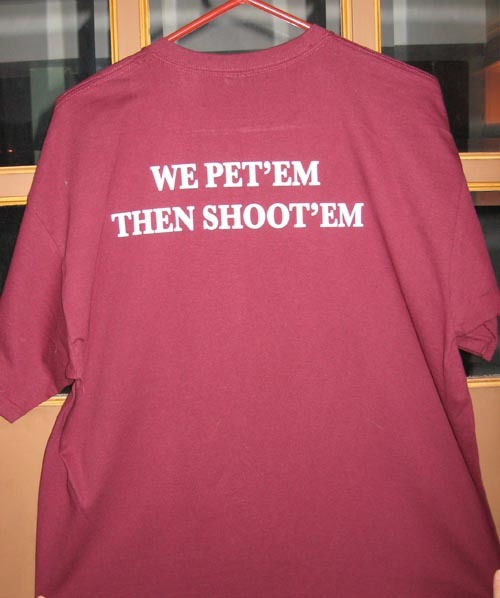 So when asked what to tell the customers…..she told him to tell them…”we pet em’, then shoot em’.”. THEN the people got it. They haven’t had any questions since and everyone thinks it’s funny. Later they decided since so many people liked it they would have T-shirts made. Some people “just have to have one” to send to someone or wear. It’s a big thing around here. A lady that has a company that makes T-shirts, caps, and hoodies has an outfitter husband, so she was picked to immortalize the special slogan that puts a smile on the face of everyone that reads it. 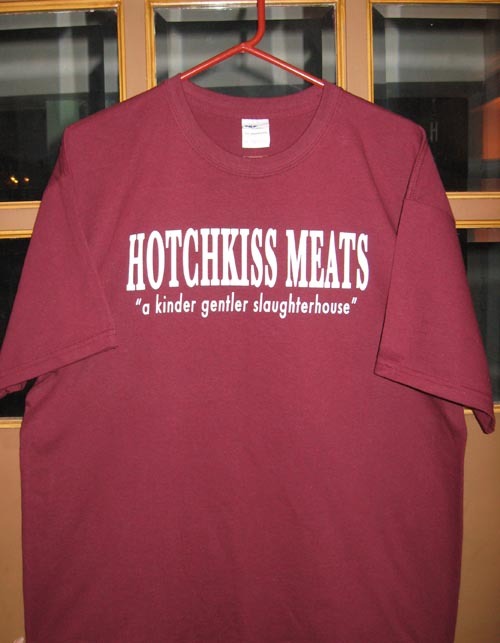 So….we hope you enjoy your shirt and we know people will comment when you wear it! Look in the Retail section.